Cambridge American Military Cemetery (established 7 December 1943, dedicated 16 July 1956), is a 30.5 acre permanent monument to those members of the United States Armed Forces killed during World War II and buried in Great Britain. The land, at Coton, Cambridge was donated by the University of Cambridge, and was selected not only because of its inherent scenic grandeur but also because a large proportion of American casualties occurred in this area of England. 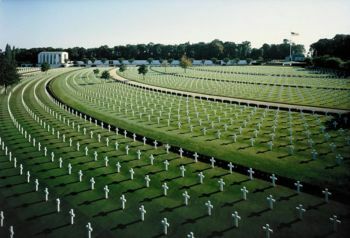 The cemetery holds the graves of 3,812 U.S servicemen, representing 42 percent of those who were temporarily buried in England and Northern Ireland during the war. After the war, the others were repatriated to their families in the United States. A large proportion were members of the United States Army Air Corps, which maintained a heavy presence in the East Anglia region during the war. The United States Air Force still operates two airbases in the area, RAF Lakenheath and RAF Mildenhall. Near the entrance, in front of the Visitors' Building, is a 72-foot tall flagpole flying the Flag of the United States of America; at the base of the pole is inscribed a line from John McCrae's poem In Flanders Fields: "To You From Failing Hands We Throw The Torch - Be Yours To Hold It High." The cemetery also holds the Wall of The Missing, 472-feet long and constructed from Portland limestone quarried in southern England. It records the names and details of 5,125 American servicemen whose remains were either never recovered or positively identified. Four statues, of a soldier, sailor, airman and Coast Guard in uniforms of the day, stand guarding the front of the wall, along the length of which runs a path of English York sandstone. The headstones are aligned in plots forming seven rows of concentric arcs, with scattered tulip trees, catalpa, beech, oak, sweetgum and roses growing within the grave plots. Twenty-four of the headstones mark the graves of unknown servicemen, and two headstones represent burials of two and three men respectively, whose names were known but whose remains could not be separately identified. The headstones are in the form of Latin crosses, except for the graves of Jewish servicemen which are marked with Stars of David. Police states-Nanny states violate the United States Constitution-Bill of Rights (especially Second Amendment and Fourth Amendment) and Citizen's Unalienable rights by not upholding their oath to support and defend the Constitution.